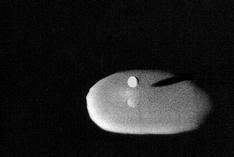 The animation is a milk drop splashing into a shallow pool. The sequence was produced from a series of drops with the photograph taken at slightly different stages of the splash evolution. These, and all other photographs on this site, were taken with the aid of the equitpment designed and built by the authors, unless otherwise stated. Some of the images displayed on-line here are available for sale from the Alamy picture library. If you are interested in purchasing any of the images here which are not currently listed with Alamy, please contact us.